Think-ets tiny trinkets for imaginative play – What is Think-ets? Remember when we were kids, and we played endless games of jacks? 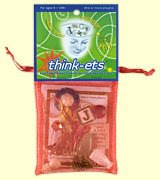 Think-ets is the 21st century version, a fun and unique assortment of 15 miniature trinkets from around the world contained in a small carrying pouch, perfect for playing games, collecting and trading with others. Think-ets is portable, fun, even brainy. No two pouches are exactly alike; there are 10 different games you can play with think-ets. It's the perfect game for restaurants, traveling, and small group conversation starters. Children and adults enjoy this amazing game. 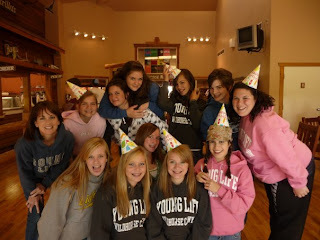 My first time playing was with a group of teen girls, and we had a blast playing What’s Your Story? Each of us chose a trinket and began a story popcorn style. It was fun to hear as each teen added her part of the story using her trinket. "Kick off your shoes & go Barefoot" is the slogan at Barefoot Books http://www.letsreadbarefoot.com/. They have a great selection of books and CD’s for children that inspire them to read. Barefoot Books stories and artwork combined with sharing the world’s diversity and different cultures while focusing on themes that encourage our children is outstanding. The most recent book I have shared with my two boys (ages 6 and 9) is Mama Panya’s Pancakes by Mary and Rick Chamberlin. This great story teaches readers about life in Kenya and has a wonderful lesson on sharing. Thanks to Julie Doherty of Barefoot Books, 24/7 MOMS is giving away a copy of Mama Panya’s Pancakes to one of our 24/7 MOMS. Leave a comment here on the 24/7 MOMS blog with your email address, and on November 20th we will draw one winner. What is your Favorite Family Fun this week? Three of my five children have birthdays over the next three months – October, November and December. Can you tell the mother with the organization obsession was not very organized when it came to planning out her children? Seriously - 3 birthdays in a row along with Thanksgiving and Christmas! However, even with the chaos of birthdays, holidays and the various others fall events in our family, I still enjoy celebrating each child's birthday with special traditions. If you are like me and always looking for new ideas, then you might find my list of birthday tradition ideas helpful along your mom journey. It is true, I have often been referred to as a tradition junkie. And NO, I do not do each and every one of the ideas on the list. So, do not stress out for me or you. Birthdays are an opportunity for us to celebrate our children and show them that they are special and valued. · Write on bathroom mirror with lipstick: “Happy Birthday”. · Serve a family morning breakfast: Child wakes up to decorated table with a theme (use leftovers from past parties). Be sure to have a small gift at their seat. · Serve breakfast to them in bed. · Make them King or Queen for the day – even use a pretend crown. · Surprise your child with a new birthday outfit to wear. · Decorate their bedroom so they wake up to it or comes home to it after school. · Have Dad send flowers, candy, cards, etc. to school for them. · Have the dinner table decorated, special table cloth, etc. · Allow your child to choose their favorite meal or place to go out to eat. · Decorate your child’s classroom door with poster decorated with pictures of the birthday child. · Decorate their school desk. · Make a time capsule. · Make a birthday video tape each year of the child. Keep adding to it year after year. · Write a letter or card each year to your child. · Hang a special birthday flag outside your house. · Mark child’s height each birthday on a growth stick. · Host a family party. · Host a friends party. · Have the birthday guests sign something – sheets, piggy bank, frames, pillow case, etc. · For the December birthday child, celebrate with family on the December date, then with friends in January. Every child likes their birthday to last for a month. · Celebrate ½ birthdays – 5½ or 10½ with ½ a cake, ½ a glass of milk, ½ a toy & they earn the other half. · Celebrate with an adopted birthday party on their adoption date. · Send a birthday-in-a-box if your child is away from home on their birthday. · Have professional portraits taken each year. · Tablecloth signed and hand printed by birthday child each year. · Give your child helium balloons for the number of years old they are, and let them go outside and release them into the air. · Hand prints on paper. · Take your child shopping to pick out their birthday party supplies. · Sit down and plan their party with them, get their ideas. It got me thinking - what does it mean to me to be a MOM? We could probably each come up with our own list of 1001 things. So, today I toss the question out to you, the 24/7 MOMS - What does it mean to YOU to be a MOM? Leave a comment or email us at team@247moms.com and share with us what it means to you to be a mom. Tuesday has arrived again, and it’s time for this week's thrifty finds! FREE – Haydee Chocolatier sample box of 8 assorted truffles - http://www.haydeechocolatier.com/sample.php Haydee Chocolatier represents an idea: An idea that gourmet chocolate shouldn't cost gourmet prices. An idea that quality is not just an ideal, it's a standard. The philosophy that every single truffle that rolls off of our line and into your hands should be excellent. The notion that natural products are worth the hassle. My online Bargain find this week came out of the NEED for a new back pack for Nate-no, thanks to our puppy, Sophie, who decided to make Nate-no's backpack her new chew toy. They had a variety of backpacks starting as low as $3.19 which were 75% off the original price. These are such great deals I even bought an extra one just in case. You might take time and search other clearance items online at Target. I was impressed with the numerous clearance items available. Looking for ways to stretch the mighty dollar for holiday shopping means beginning my holiday shopping early, so that I can find great sales and bargains. 1. www.bigidea.com, home to Veggie Tales, 3-2-1 Penguins and Larry Boy, is having a great sale right now. A variety of CD’s are on sale for $3.99 each and DVD’s for $9.95. 2. Markdown Mondays at Amazon is a great place to check on Monday to see which toys they have on sale - http://www.amazon.com/. Also, be sure to check out their other clearance and sale items. 4. The Disney Store outlet has some wonderful bargains on clothes, toys and much more at www.disneystore.com, then click over to Disney Outlet. 5. A new web site I came across was http://www.kidsurplus.com/ - they have a big selection as well as a clearance section. Right now they have a shipping offer of $1.99 on all orders over $50.00. Where do you shop for bargains? Comment or email 24/7 moms at trisha@247moms.com with your great shopping hints. During my mom journey I have found the best place to collect new recipes that my family loves - from other mom friends. 24/7 MOMS is looking for new mom recipes to share with the 24/7 MOMS community. What is your family's favorite mealtime recipe? Send your recipe submissions to trisha@247moms.com. This week's recipe was submitted by 24/7 MOM Tanya. I am a cream cheese lover! I buy those great big containers of cream cheese at Costco and use it all before it goes bad. I use it in, well, pretty much everything! I also love stroganoff. I could eat it once a week or more. My husband, on the other hand was not a big fan of my current stroganoff recipe. So, I searched on my favorite recipe website - http://www.allrecipes.com/ - and found a super easy stroganoff recipe with cream cheese, and my husband likes it! Here is the recipe courtesy of All Recipes. Remember to Send your recipe submissions to trisha@247moms.com. Have you seen the adorable henjen bags? Right now henjen is offering our 24/7 MOMS a 20% off online discount at http://www.henjenhandbags.com/ through October 31, 2008. Use code 247mom at checkout. Thanks to henjen we were able to giveaway one of these Fun, Funky and Functional mom bags at our 2008 24/7 MOMS Conference, making a cool mom chick who is now strutting around with her very own new henjen bag. I am always on the hunt 24/7 for bargains, FREEbies and dollar stretching ideas. Here are today’s Thrifty Tuesday Finds to help you save money as a 24/7 MOM. My youngest, Nate-no, is a popcorn addict. So today I did a little research on homemade popcorn recipes to help stretch the mighty dollar on snack foods in my home. Stir in the kernels, turning with a spoon so that they are evenly covered with oil, then spread them in one layer on the bottom of the pot. (I just shake them around a bit). Cover the pot, leaving a small space at the edge for escaping steam. As soon as the first kernel pops, move the pot gently and continuously back and forth over medium-high heat until the popping stops. Turn into a warm bowl. Toss with melted butter, if desired, and salt to taste. Put sugar, butter and marshmallows in a large bowl. Microwave on high for five minutes, stirring twice. Pour over popped corn, tossing with a wooden spoon, with clean buttered hands, form into balls. Place on waxed paper or aluminum foil. Allow to set, then EAT your yummy treat or wrap in colorful saran wrap for gift treats. Microwave butter, brown sugar and syrup in a 1 3/4 quart bowl on High for 5 minutes. Stir 1/2 way through. After 5 minutes, stir in baking soda. Microwave for 1 1/2 minutes more. Put popped popcorn in a large paper bag. Pour mixture over the popcorn. Shake well. Place bag in the microwave on High for 1 minute. Pour caramel corn into a bowl or onto a tray. Allow to cool. Break apart. Enjoy. Looking from some great bargains on books, gift items, CDs and DVDs? Check out the bargain section at http://www.cbd.com/. I found great stuff for kids, teens and even us moms. There are 100’s of great bargains. Busy, fun, crazy, on-the-go - are what the fall season has been so far for this 24/7 MOM. Once again I am thankful for the Crock-Pot recipes the moms have been emailing me. Here are two more recipes for you to try out in your Crock-Pots. Saturday I made the Taco Soup for my family, along with chicken quesadillas - a simple yet yummy meal. Brown the beef and drain. Add remaining ingredients and stir. Cook on low for 6-8 hours. Serve with sour cream, cheddar cheese and tortilla chips. Place all ingredients in Crock-Pot to cook. Cook on low 6-8 hours. Before serving, de-bone the chicken, take out the parmesan rind, and add either fresh spinach or green beans or even kale (they’ll cook just enough by the time you de-bone the chicken). Serve with the parsley garnish and maybe some grated parmesan cheese. It's all over the media - Go Green, Go Natural. But where do I begin, especially when it comes to my house cleaning products? In my search for natural cleaning products I was introduced to Green Works by Clorox, a line of natural cleaning products that actually cleans with all the power we expect in Clorox products. Green Works' full line of plant and mineral based cleaning products are at least 99% natural. Say "Hello, deep clean. Goodbye, harsh chemical fumes." when you begin using one of the many available products. You can check out their full product line at http://www.greenworkscleaners.com/. Green Works has challenged me to 30 Days to Natural - http://www.30daystonatural.com/. So, for the next 30 days, this 24/7 Mom will give up using her cabinet full of cleaning chemicals and use only the Green Works cleaning products that Mom Central and Green Works (Clorox) sent me. Would you like to take on the same challenge? Check out http://www.30daystonatural.com/. Sign up for the daily email or text tips to keep you going the natural cleaning way. Be sure to watch the video diaries of other moms who are taking the 30 day challenge and plant your daisy at http://www.30daystonatural.com/. Comment and let me know if you have accepted the 30 Days to Natural challenge. 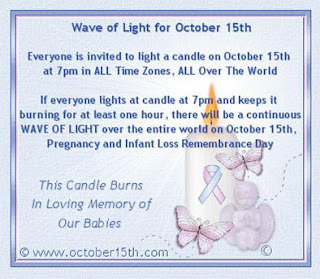 Today, October 15th is the offical Pregnancy and Infant Loss Remembrance day. A day for Moms, like myself, to remember our babies that took an early flight into the arms of Jesus. I often visit the Remembering Babies web site http://www.october15th.com/. There are some great resources and ideas to help those who have experienced loss, as well as memorial keepsake items to purchase, and much more. I recently came across two sweet poems to share with you about the early loss of a baby. From the very beginning I loved you,As I made plans to hold you and rock you:You were tiny and helpless as you lay in my womb,But something went wrong and soon you were gone;My young heart was broken, my tears fell like rain,I'd never known such heartache and pain. I wonder who you look like, me or your dad,Do you have my smile and his eyes?Would you have been big and tall or tiny and small?We had dreams for you that reached to the skies.It was long, long ago and I still miss you so,Thanks to Jesus, I'll see you in heaven. I'll hold you in heaven someday,When my trials on earth pass away;The angels have rocked you, the Father watches over you,I know you're waiting for me;I never could hold you or tell you "Goodbye",But I'll hold you in heaven someday. You asked, "How are you doing?" As I told you, tears came to my eyes...and you looked away and quickly began to talk again. All the attention you had given me had drained away. "How am I doing?" I do better when people listen, though I may shed a tear or two. This pain is indescribable. If you've never known it, you cannot fully understand. Yet I need you. When you look away, I am again alone with it. Your attention means more than you can ever know. Really, tears are not a bad sign, you know! They're nature's way of helping me to heal. They relieve some of the stress of sadness ....but you are wrong. The memory of my loved one's death will always be with me, Only a thought away. My tears make my pain more visible to you, but you did not give me the pain...it was already there. When I cry, could it be that you feel helpless, Not knowing what to do? You are not helpless, And you don't need to do a thing but be there. When I feel your permission to allow my tears to flow, you've helped me You need not speak. Your silence as I cry is all I need. Be patient...do not fear. Listening with your heart to "how I am doing" relieves the pain for when the tears can freely come and go, I feel lighter. Talking to you releases what I've wanted to say aloud, clearing space for a touch of joy in my life. I'll cry for a minute or two... and then I'll wipe my eyes and sometimes you'll even find I'm laughing later. When I hold back the tears, my throat grows tight, my chest aches, my stomach knots... because I'm trying to protect YOU from my tears. Then we both hurt ME, because my pain is held inside, a shield against our closeness and YOU, because suddenly we are distant. So please, take my hand and see me through my tears... then we can be close again. A wonderful resource I have read over the years in dealing with my own personal loss and also have given to numerous other moms who have faced loss is a book titled "I'll Hold You in Heaven", by, Jack Hayford. Have you ever dreamt of being a writer, sharing your thoughts and ideas with others? Have you recently discovered a love of or interest in writing or blogging as a mom? If you are a MOM and enjoy writing, especially to Inspire, Equip and Connect Moms during their mom journey then 24/7 MOMS wants YOU. NO Experience needed. Email trisha@247moms.com for additional details. WOW, Amazing, Incredible, Out of this world, Too much fun, Inspiring - these are some of the many comments we heard from moms about their experiences at the first 24/7 MOMS Conference. Julie Barnill kept us laughing, Jenn Alexander shared her heart through music, the overflowing bag of Mom Favorites, the “Oh, how sweet it was candy buffet”, the inspiring workshops , 24/7 MOMS cool lime green canvas goodie bags for each mom, late night fun, games, spa time and movie night. The 2008 24/7 MOMS Conference was truly a MOMorable time. Sign-up today at www.247moms.com to be in the MOM know of future 24/7 MOMS events and happenings. There’s a new organization in town for moms. 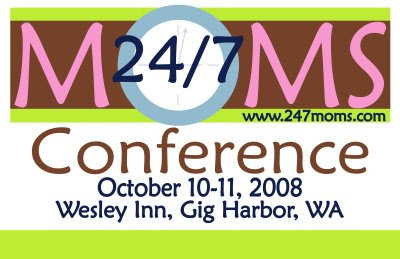 “24/7 Moms” will host its first two-day conference Friday and Saturday at the Best Western Wesley Inn in Gig Harbor. The group’s founder, Gig Harbor’s Trisha Novotny, hopes attendees will walk away inspired the the knowledge that what they do really matters. Novotny was a member of MOPS International — Mothers of Preschool Children — for 13 years. She formed 24/7 Moms in January to help mothers connect with each other after those preschool years. Novotny said today’s families are overwhelmed because there are more expectations on them. Many don’t have the support of an extended family. “Back in the 1930s and ’40s, women had grandmothers, sisters and aunts around them,” she said. “People didn’t pack up and move out of town. I raised five children with no family around me. The conference this weekend will feature guest speakers from across the nation, including author and mothering expert Julie Barnhill, Dream Dinners co-founder Stephanie Allen and Krista Colvin, a guest blogger for Working Mother Magazine. Gunderson said stress is the new identity thieves for moms. For more information or for a conference schedule, visit www.247momsconference.com. For information about the organization, call 253-222-5434. A Web site is under construction for the group at www.247moms.com. 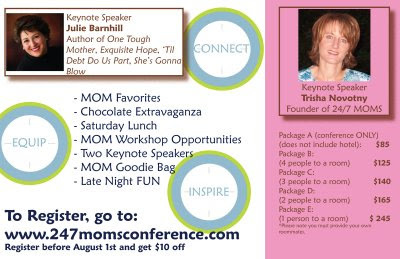 For conference schedule or to register, visit www.247momsconference.com. Place: Best Western Wesley Inn and Conference Center, 6575 Kimball Drive in Gig Harbor. Reach reporter Susan Schell at 253-853-9240 or by e-mail at susan.schell@gateline.com. Safeway now features online printable coupons. Select and Print the coupons you desire, then head to your local Safeway to Redeem and Save. Check out the Safeway coupon site at http://www.safeway.com/ifl/grocery/Coupons#iframetop to see what great coupon savings are available in your area today. Where do you find your grocery coupons? Did you get out your Crock-Pot yet and try one of those simple meals from last week's “Let’s Make a Meal Mondays” recipes? If you don’t own a Crock-Pot, I would encourage you to check your local thrift stores or watch for some great fall sales on them. It is one mom tool that is worth purchasing! This week I have two more simple, family-pleasing meals to share with you. Spray crock with non-stick cooking spray.Mix rice, water, and soup. Pour into crock.Put the thawed chicken and Shake-n-Bake into a roasting bag . Inflate the bag, twisting the top to trap air and shake to coat the chicken.Poke 3-4 holes in the bag and place on top of the rice. Can it get any easier than these great recipes? 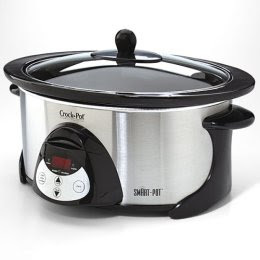 Send your simple Crock-Pot recipes to trisha@247moms.com to share with the 24/7 MOMS. There are only 6 days left until the MOMS arrive at the first 24/7 MOMS conference, and the FUN begins. I can hardly wait to hear Julie Barnhill Inspire me as a MOM, to Give-a-way all the GREAT Mom Favorite stuff, taste the incredible SWEETS at the buffet and meet all my new mom friends who are joining us. Will you be there? There is still time to register at http://www.247momsconference.com/ and Im still taking $20.00 of your registration so hurry register TODAY. FREEbie Tacos – Free Del Taco chicken tacos - just sign-up for the Raving Fan E-club online at http://www.deltaco.com/page8.html and you will get 2 free chicken soft tacos. Plus, on your birthday you will receive a free milkshake. FREEbie Jelly Beans – It's true - Gimbal’s Gourmet Jelly beans is giving away a free delectable sampling of their exceptional variety including: Tiramisu, Strawberry Daiquiri, Lemon Meringue, and Red Delicious. Each jelly bean bursts with an intense flavor that you can’t resist. Just fill out the quick form at http://beta.candydirect.com:8222/Sample/SampleForm.aspx?id=3 and get your free sample today. Have you surfed over to http://www.greatschools.com/? It's a web site that allows you to read and post REAL mom (parent) and student reviews on your local schools. Some of the other great features on this site are the ability to research and compare schools, the parent community - a place to ask question to other parents for education advice, wonderful information on helping children with learning disabilities, along with many articles on education topics. Their slogan is “Involved Parents. Successful Kids.” So, if you are planning a move in location or looking for some information on your child’s education, check out http://www.greatschoools.com/.